Over the years, I have gotten lots of great money saving advice from my readers! In this post, I’m going to share some of the tips and tricks they have passed along regarding grocery purchasing and delivery while staying at a Disney resort. If you’ve chosen to skip the Disney meal plan and don’t want to splurge on the Disney restaurants, counter service, or quick service food options, you will probably need groceries! Most Disney hotel rooms and off site hotel rooms have mini fridges now, perfect for storing a few groceries. Many hotel rooms also come with microwaves, but you’ll want to ask when you book. Weather you fly or drive to Disney World, you may not feel like running to a grocery store first thing. Grocery delivery services have become more and more popular over the years, which makes saving money on groceries a no-brainer! If you can somehow pack a crock-pot or rice cooker in your luggage, your possibilities are endless! Have you every tried cooking something in a coffee pot? What about making a panini using an iron? A little bit of creativity goes a long way! I love the idea of storing food in the mini fridge but I think we would be flying. Is there a place close to buy to purchase groceries or did you pack them with you? Or maybe only had them when you drove? Great question. When we drove, we obviously had a car to drive to a nearby grocery store. When we’ve flown, my grandparents that live near by were able to bring us food. What I can tell you, is that the food court there at the resort does sell loaves of bread, milk, etc. but at a higher than normal price. I’ve thought many times that if my grandparents were not there, I could always try packing dry goods in a suitcase and carry a loaf of bread in my purse! I’d pack cereal, pop tarts, peanut butter and jelly, etc. You can’t carry-on any liquids, so it kind of rules out a cooler full of dairy with ice, etc. Check google maps, trip adviser, or the Disney mom panel: http://disneyworldforum.disney.go.com/ for ideas! Have you prepared meals in a hotel room before? 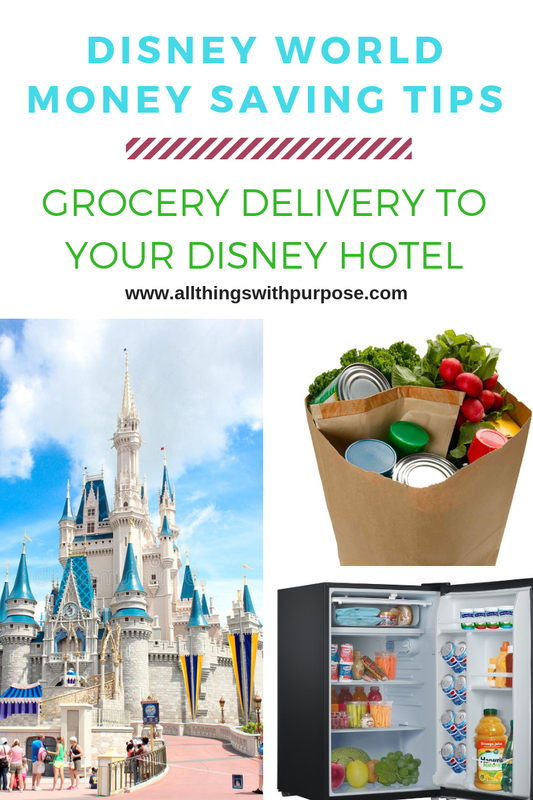 Have you saved money by having groceries delivered to your Disney hotel room?